There are 2 research divisions in the Institute: 1. Geography and Geoecology, 2. Water Problems, and branch in Astana. They include 10 specialized departments. 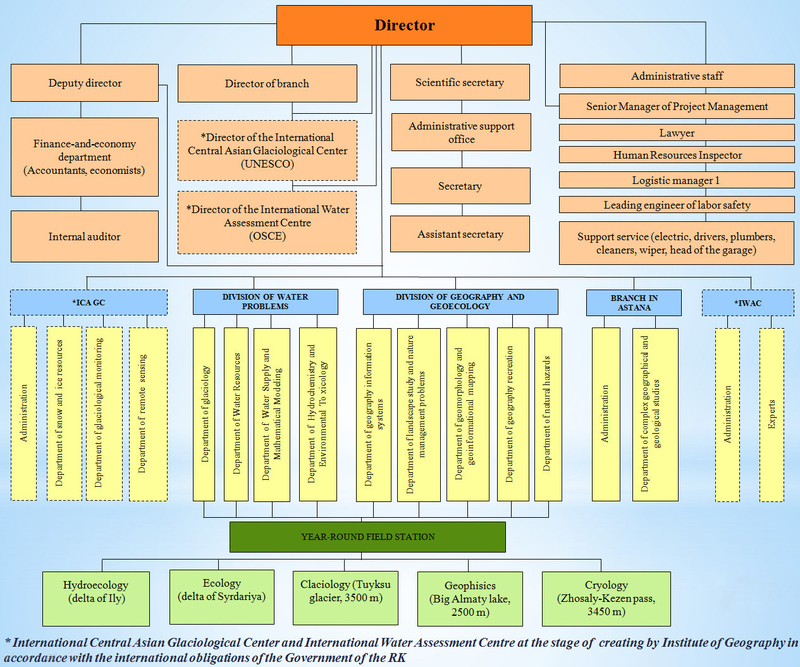 Division of Water Problems consist of the Departments of Glaciology, Water Resources, Sufficiency of Water Supply of Natural-Economic Systems and Mathematical Modeling, Hydrology of Water Bodies, Hydrochemistry and Ecological Toxicology and Natural Hazards. Division of Geography consists of 4 departments: Geography of Tourism and Recreation, Landscape Study and Nature Management, Geomorphology and GIS cartography, Geographic Informational Systems. There are 183 employees in the Institute including 2 Academicians of the National Academy of Sciences of the Republic of Kazakhstan, 11 Doctors of Sciences и 24 Candidates of Sciences, 1 PhD, 37 Master’s of Sciences. More than 50 employees of the Institute are young specialists.